If you like the iPad mini(s appl), but wish it only cost half the price and ran Android(s goog), Acer has just the tablet for you. On Friday the company introduced the A1-830, a 7.9-inch Android tablet that bears more than a passing resemblance to the iPad mini. The specs aren’t quite top-notch, but it only costs $149. The first thing you notice about the A1-830 is that it looks a lot like the iPad mini. It has an aluminum body and a white bezel. It also features the same size 7.9-inch display with 4:3 aspect ratio. It’s a bit chunkier, however, at 0.32 inches thick and 0.84 pounds. Physical similarities aside, the A1-830 is closer to the original iPad in terms of specs, rather than the new retina display-equipped model. The 7.9-inch IPS LCD only features 1024 x 768 pixel resolution, which is pretty low at this point. The $199 Nexus 7, by comparison, features a much sharper 7-inch, 1920 x 1200 display (which also qualifies as a “retina display,” even without Apple’s branding). And the A1-830 is powered by a 1.6GHz Intel(s intc) Atom Z2560 (Clover Trail+) processor, rather than a newer Bay Trail chip. While the tablet runs Android, it ships with Android 4.2.2 (Jelly Bean), which places it a few generations behind the latest version. You do get a 1080p rear camera and 720p front-facing camera (Acer doesn’t specify the megapixels), along with dual rear speakers, 16GB of storage and a microSD card slot for further expansion. Overall, though, this doesn’t seem like a strong alternative to the Nexus 7, which gets you better hardware and software for an additional $50. Unless all you really want is a tablet that has the iPad mini’s form factor, your money will likely be better spent elsewhere. 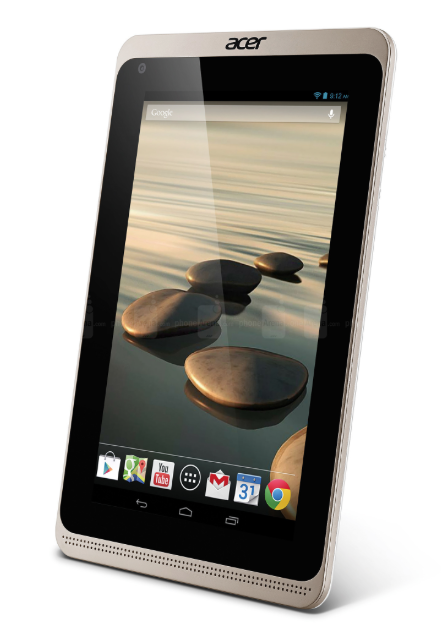 Acer also introduced an even less expensive tablet in the form of its $129 third-generation B1-720. It’s thinner than previous generations, but like the A1-830, it features lower-res 1024 x 768 display. It’s also running on an older 1.3GHz dual-core MediaTek MT811 processor and Android 4.2.1, which places it firmly on the low-end of the spectrum. Like the A1-830, judging by the specs alone, I can’t help but feel like it’s worth it to spend some extra money on a higher-end device. Even the Kindle Fire HD will get you more power and a sharper screen, as long as you don’t mind being tethered to Amazon(s amzn). This post was updated at 8:31am to show that Acer has changed the price of the A1-830 from $179 to $149. The resolution of the N7 you stated is from the first gen, 2012 model. The current nexus 7 has a 1920×1200 screen. Thanks for catching that. Fixed this. I had an Acer Android tablet that needed a factory repair twice in 11 months.